The Second Street Bridge crossing the Scioto River into Portsmouth is closed due to high water. As of late Monday afternoon, the National Weather Service in Wilmington and the Scioto County Emergency Management Agency (SCEMA) were stating a flood watch affecting all of Scioto, Pike and several other neighboring counties would stay in effect through Tuesday afternoon. According to the National Weather Service, a stalled “frontal boundary” will result in a prolonged period of precipitation bringing 1.5 to 2.5 inches of additional rain through Tuesday afternoon. The weather service warned with the ground already saturated, as well as with rivers and streams still near or at flood stage, this additional rainfall will likely lead to flooding in certain areas, including near creeks or other waterways. The weather service advised people in the watch area, especially those living in areas prone to flooding, to be prepared to take action if flooding develops. Residents in flood prone locations especially are cautioned to monitor the latest weather forecasts be alert for possible flood warnings. Although the watch was set to expire Tuesday afternoon, the weather service said a flood advisory would continue for the Ohio River at Portsmouth as well as for the Scioto River at Piketon. No specific time limit was placed on the termination of the watch for either Portsmouth or Piketon. Chris Hogue is a meteorologist for the weather service. He said a flood watch is intended to be a temporary warning that various types of flooding could occur. A flood advisory, on the other hand, is meant to let residents know flooding is highly possible. Hogue added an advisory is still a step below a flood warning, which means flooding actually has occurred and could continue to occur. With regard to the watch in place for the Ohio at Portsmouth, the weather service said the Ohio River was at 48.9 feet as of 1 p.m. Monday. Flood stage for the Ohio at Portsmouth is 50 feet. The weather service predicted the river has crested and will continue falling through Tuesday night. However, additional rises to above flood stage are possible later this week. At stages near 53 feet, the weather service stated backwater flooding on tributaries occurs, with low-lying impacts and flooding of some county roads. Riverfront homes can become surrounded by water, with some homes flooded by several feet of water. As for the Scioto River at Piketon, that waterway had reached 19.6 feet at noon Monday. Flood stage for the Scioto at Piketon is 20 feet. The weather service said minor flooding is forecast. While the river fell below flood stage Monday morning, it was expected to rise above flood stage again by Tuesday afternoon and continue rising to a predicted 23 feet by Wednesday afternoon. The river level should then begin to trend downward but remain above flood stage until further notice. According to the weather service, at 23 feet, backwater flooding worsens along creeks flowing into the Scioto River. Stretches of several low-lying roads near the river were reported as flooded Monday afternoon. The most extensive flooding likely has and will continue to occur in Scioto and Camp Creek townships in southern Pike County. Even as the weather service talked about flood advisories and watches, Scioto County Sheriff Marty Donini issued a level I snow emergency that went into effect late Sunday afternoon. According to a sheriff’s office spokesperson, the emergency was called off around 7:30 Monday morning. According to the sheriff’s office, a Level I emergency means county, city and township roads are potentially hazardous and drivers are warned to use appropriate caution. In a Level I emergency, residents should expect snow and ice are sticking to overheads, bridges and rural roads. All the wet weather has predictably caused a few road closings, according to Ohio Department of Transportation spokesperson Kathleen Fuller. According to Fuller, eastbound SR 73 between U.S. 52 and SR 852 was closed because of flooding as of Friday afternoon. In the same general area SR 239 in West Portsmouth also was closed. The Second Street bridge was shut down Saturday because of the high level of the Scioto River. Fuller said how long the roadways will remain closed is difficult to say and obviously highly weather dependent. She said most likely residents can count on the roadways being blocked until at least close to the end of this week. Part of the problem, Fuller added is even once waters recede, there is always cleanup work to do. Mud, tree limbs and other debris all need to be cleared away before streets can be open to traffic. Go to the ODOT website for the latest updates. 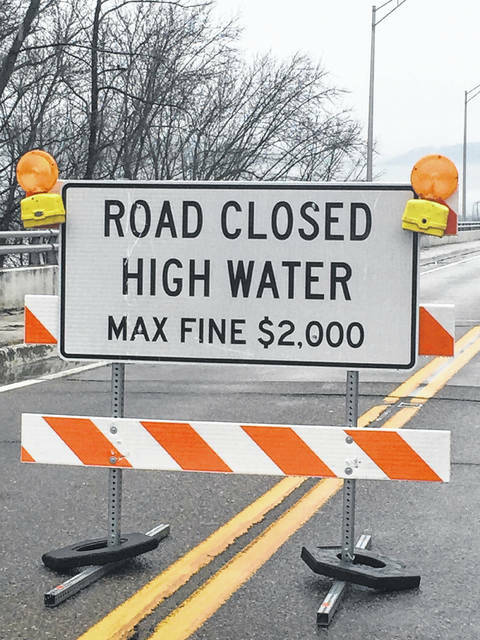 https://www.portsmouth-dailytimes.com/wp-content/uploads/sites/28/2019/02/web1_High-Water.jpgThe Second Street Bridge crossing the Scioto River into Portsmouth is closed due to high water.